Since my previous post on the SodaStream boycott, I’ve received a number of questions regarding which specific campaign/s to support. While there have been a number of great local actions around the country, I’m happy to announce that a new interfaith coalition has just launched a national boycott effort that includes a petition as well as a spoof ad contest. I hope you will join me in signing on to this important campaign. Even if there were hundreds of “production facilities” all over the world, it would not change the fact that the factory in Mishor Adumim is built on land stolen from the Palestinians and thus violates human rights and international law. At 15,256 m2, the plant is four times larger than the headquarters in Tel Aviv, and eight times that of the other Israeli plant at Ashkelon, which produces only flavors for soft drinks. The plant in China produces only “certain components”. The “production facilities” in Germany, Sweden, New Zealand, Australia, South Africa, the Netherlands and the USA are mere sales and marketing offices and refill stations for CO2 cylinders. Source: Sodastream International Ltd. Annual Report for the Fiscal Year Ended December 31, 2010, “Manufacturing and Production,” p. 37 and “Facilities,” p. 40. The fact that a company such as SodaStream, which profits from the Israeli occupation regime, considers itself a benefactor of the Palestinians is downright bizarre. Even if working conditions for the Palestinians at the Mishor Adumim factory were as described (something that has been proven false in the past by the Israeli organization Kav LaOved), the fact remains that, as subjects an occupation regime, these workers do not enjoy civil rights (including the right of workers to organize) and are under constant threat of having their permits to work in the settlement revoked by the company at any moment. Palestinian workers often have no choice but to work in the settlements, with high unemployment rates that are a direct result of the Israeli occupation. The 2011 United Nations Conference on Trade and Development report explicitly links the decline in Palestinian agricultural and industrial sectors and the dire humanitarian conditions with Israeli government policies, in particular the confiscation of land and natural resources, restrictions on movement of people and goods, and isolation from international markets. Only a colonial mindset could claim to provide jobs to the very same people whose land and freedom have been stolen. To speak of “peaceful coexistence” between people who do not have equal rights and equal social, economic and political opportunities is absurd. Among Sodastream employees, there is a marked difference between the conditions of the occupiers and those who suffer under occupation. For example, just as in Apartheid South Africa the black majority was allowed to enter areas reserved for whites only in order to work, so do the Palestinians depend on the occupying power for work permits. Furthermore, the Jahalin Bedouin, who had already been driven from their lands in the Negev in the 1950s, were then expelled from the very area where the Sodastream has its factory. Committing to not to expand an illegal activity, which according to the company website, Sodastream has been carrying out since 1996, counts for very little. The fact remains that the main production facilities are located in an illegal Israeli settlement in violation of international law. Sodastream’s annual report lists among its “risk factors” the possibility, due to negative publicity and boycotts, of having “to transfer a significant portion of manufacturing activities to a location outside of the West Bank” that would “limit certain of the tax benefits for which we are currently eligible”. In fact, according to the web site for the Mishor Adomim Industrial Park, it is designated as “Development Zone ‘A'”, which enjoys the highest tax incentives from the Israeli state. And finally, the Palestinian territories are occupied, not “disputed”, as recognized by the International Court of Justice, the International Committee of the Red Cross and the Conference of High Contracting Parties to the Fourth Geneva Convention, among others. 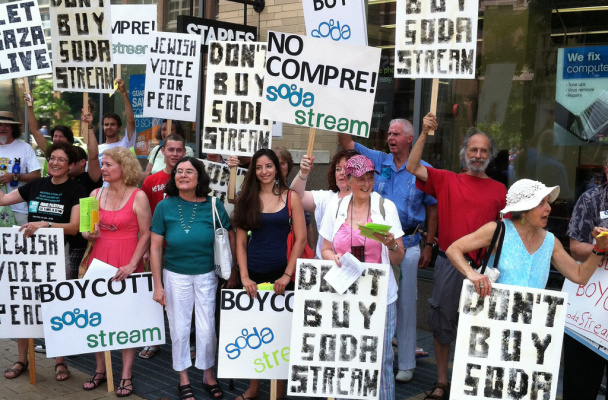 Swedish activists inform us that COOP Sweden claims to have the results of an investigation that justify, in their view, the marketing of Sodastream products. COOP Sweden has refused, however, to share the report with the Swedish activists. If Sodastream would like to provide us with the report, we would be happy to comment on it. It is well known that Israeli and international companies consider Israeli laws on environmental protection inapplicable with regard to factories in the occupied West Bank. According to 2009 report by the Israeli organization B’Tselem, Israel does not enforce environmental laws in the settlements and industrial areas in the occupied West Bank. Clearly, an auditing organization that certifies a factory located in the occupied Palestinian territories has no credibility whatsoever. The Stop Sodastream campaign will continue to challenge the deceptions of Sodastream, organizing initiatives to reveal the truth that the company wants to hides and promoting a boycott of its products. This entry was posted in BDS, Environmentalism, Human Rights, Israel, Palestine on January 29, 2013 by Rabbi Brant Rosen. Another 250 people killed in Syria yesterday, and the bodies of around 80 young people killed execution style discovered near Aleppo, but the “human rights” people have more important things to do…..close down SodaStream near Ma’alei Adumim and throw the Palestinians there out of work. I think everyone now sees how committed to “human rights” these people really are. It is not “human rights” that these people care about, simply bashing Israel. Wow, Ike, I am starting to appreciate how deeply you care about Syria and Syrians. I had no idea, and thank you with all my heart. So, what are you doing to help them? I never claimed to be a univseralist human-rights activist committed to social justice. I am an Israeli and as such I am very worried about the situation in Syria. Assad wouldn’t have had to face this bloody uprising had he invested in peace and developing his country instead of arming himself to the teeth with useless weapons which were meant primarily to scare his neighbors and awe his own people with his supposed willingness to confront Israel. He hoped that giving his people an exciting policy of militarism would divert their attention from the repression, corruption and economic stagnation of their own society. We see that they finally had enough, but the danger is that other radical groups, with a similar agenda to that of Assad will take power there and condemn the Syrian people to more decades of the same, failed policies. Thus, the welfare of the Syrian people IS a vital interest to Israel and all of Syria’s neighbors. However, the main props of Assad, Russia and China are not vulnerable to Israeli pressure due to Israel being a small country. However, shoud Americans or Europeans finally wake up and stand up for the “human rights’ they CLAIM they care about, they could organize effective pressure on China and Russia by way of boycotts and demonstrations to force them to stop propping Assad up and to try to organize some sort of democratic opposition groups to take power when he finally falls and not let the country be taken over by jihadists. Ah, I see, Ike. You couldn’t possibly care less about the welfare of the Syrian people. Thanks for clarifying that. Thanks, also, for clarifying just exactly how out of touch you are with reality when it comes to Syria, Syrian people, and Bashshar Al Asad. Here are some actual facts for you, though I don’t doubt you prefer the nonsense you apparently have memorized from propaganda brochures. Who is not investing in peace? – Bashshar Al Asad has made more than one attempt to reach out to Israel and negotiate terms of peace, which Israel has ultimately rejected. – Bashshar Al Asad is also a signatory to the Arab League Peace Proposal which has been on the table for ten years, and which for ten years Israel has rejected even as a starting point for negotiations. – Despite the fact that Israel has made several overt attacks on Syria during his tenure, Bashshar Al Asad has not retaliated. In not retaliating for Israel’s attacks on Syria he has invited severe criticism from citizens and others who have called him a coward and other things as well. – developing Syria’s manufacturing and export industry such that Syria has become the primary source in the region for a number of goods including but not limited to clothing (men’s, women’s, children’s and infants), accessories, baby supplies and equipment, and fabrics. – taking steps to improve and modernized Syria’s agriculture industry, including introducing drip irrigation where appropriate and other “green” technologies that have reduced water usage in some areas, and allowed previously uncultivated areas to be brought under cultivation..
– Improved transportation infrastructure, including highways, roads, buses, and trains. Since I travel quite a bit while in Syria, I have directly observed and benefited from these improvements. – Rebuilding infrastructure in the Old City of Damascus, including new sewers, and street resurfacing, while retaining the historical character of the area. – Improving tourist sites and areas, and other steps to increase tourism. – Instituting projects improving infrastructure and appearance of urban areas. – Improving technological infrastructure, making internet, including high-speed and wireless internet, widely available. Free wireless is available in most cafes and restaurants now, and 4-G is now the standard in most homes. FYI, I have observed these changes and others personally over the years. Interesting that you speak of “useless weapons which were meant primarily to scare his neighbors and awe his own people with his supposed willingness to confront Israel”. As a matter of fact there is no actual evidence of Asad arming himself to the teeth with any sort of “useless weapons”, and there are consistent denials by Syrian officials of the existence of such “useless” weapons. One might be skeptical of these denials, but given the absence of evidence, one should at least make it clear that these are merely allegations, and not a certainty. And no discussion of being armed to the teeth with “useless weapons” meant primarily to scare neighbors and awe one’s own people is complete without mention of Israel’s hundreds of nuclear bombs, not to mention the fact that Israel’s is the most militarized society in the world, and that Israel is one of the most belligerant and aggressive countries in the world. The funny thing about much of what you have said about Bashshar is how far it is from Syrian reality while at the same time closely resembling Israeli behavior. Syria hasn’t had an “Exciting policy of militarism” since Bashshar took over as President – quite the contrary, in fact. Prior to the current tragic mess, military matters have not been on the minds of most Syrians at all. The reality is that in Syria until the recent civil war no one has been aware of any “exciting policy of militarism” at all. On the other hand, as mentioned earlier, Israel has been determined to be the most militarized society on earth. As someone who spends considerable time in Syria as part of that society, I can assure you that the society has not been “stagnating” – quite the opposite, in fact. I’d love to address the rest of your nonsense, but I have other things to do today. Perhaps I will come back a bit later and finish up, perhaps not. FYI, Ike, instead of retaliating for Israel’s recent bombing inside its territory Syria is following proper diplomatic procedure and has filed a formal complaint with the UN. So, let’s see. Israel bombs, Syria goes to the international body whose job it is to resolve disputes between member countries. And you criticize Syria? Hmmmmmmm. What the ___ does that mean? Some congregations that belong to those groups? Individual members who belong to those groups? Clergy that belong to those groups? Active? Lapsed? 2/ A bit of advice (and am I not always giving good advice?). If you want people to believe that the BDS movement is a mass movement then its a good idea not to show photos with just 18 people in them. I would start at 100 and work my way up from there. I can easily find photos of obviously tiny movements who can show photos of less than 100 members. 3/ The most recent report that is referenced is from Dec 31 2010. That’s over 2 years ago. Has anything changed. Possibly, possibly not. Maybe somebody can get a more recent report. This is distressing. I frankly love my Sodastream machine and had no idea about it’s location. Is there a competitor that makes a good machine? It really is a dandy product idea. But the taste of occupation is way to bitter and additive.